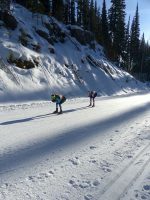 VERNON, British Columbia — For the second consecutive year, the Sovereign Lake NorAm was combined with the SuperTour for an expanded field of racers. The warm, sunny, and windless conditions on both days were a welcome change from the previous season’s cold weather and falling snow. What didn’t change was the ‘south of the border’ feel to the leaderboard. The race formats were similar to that of the Davos World Cup, just nine time zones later: Saturday was a classic sprint (Davos was a skate sprint) and Sunday included 10- and 15-kilometer freestyle interval starts. With temperatures around -2 degree Celsius and dry, untransformed snow, the waxing was straightforward both days with ski choice dominating the discussions. More than 400 racers competed, including 140 men and 84 women in the open categories. Sovereign’s 1.3-kilometer sprint course doesn’t feature large climbs, but it does reward good tactics. There were a few minor incidents off the start when the six tracks became four, and the final 270-degree turn off the bridge into the finishing straight punished tired legs and tight groups. American Kaitlynn Miller of the Craftsbury Green Racing Project (CGRP) dominated the open women’s sprint, winning the qualifier and all of her heats. In the A-final, Canadian Sophie Carrier-Laforte, of the Pierre-Harvey National Training Centre (CNEPH), pushed the pace from the start, using her double-poling power to stretch the field over the first three climbs. Miller was last into the hole and used the big climb to work her way to the front, where she was able to control the group through the tricky final turn and get first lane choice to take the win in 2:57.53 minutes. Miller’s teammate, Caitlin Patterson powered past Hannah Halvorsen, of Alaska Pacific University (APU) and the U.S. Ski Team (USST) D-team, to take second, 0.93 seconds behind Miller. Halvorsen claimed third (+2.59), Kelsey Phinney, of the Sun Valley Ski Education Foundation (SVSEF) took fourth (+2.59), and a third Craftsbury skier Liz Guiney placed fifth (+3.53). The lone Canadian in the women’s final, Carrier-Laforte, finished sixth (+4.38). The ‘technique zone’, where only diagonal stride or herringbone techniques are permitted, wasn’t a factor for the women. Finland’s Jasmi Joensuu, a junior at the University of Denver, had tested early in the week and decided to use grip wax for the one steep climb. Joensuu added some excitement the B-final, as she changed clothes and switched to skate skis for her planned cooldown before discovering that the NorAm series does B-finals. Luckily, her classic race skis were still in the start area and she was able to finish third in that heat for ninth overall. In the men’s race, Bob Thompson, of the National Team Development Centre (NTDC) Thunder Bay, salvaged Canadian pride with a win after qualifying fourth and placing second in his quarter and semi heats. Thompson was the only Canadian in the A-final, closing a gap to the leading three on the bridge turn and double poling from fourth to first to finish in 2:29.31. American Ben Saxton of the Stratton Mountain School (SMS) Elite Team finished just three-hundredths of a second back for second place, and Cole Morgan edged out his SVSEF teammate Jack Hegman by 0.03 seconds for third (+0.48). APU’s Reese Hanneman and Tyler Kornfield followed in fifth (+7.75) and sixth (+ 7.90), respectively, after being gapped early and losing the battle for the four lanes on the first hill. In the B-final, the lone Canadian in that heat, Evan Palmer-Charrette (NTDC Thunder Bay) recovered from finishing sixth in his semifinal to take the win (for seventh overall) and earn some important series points. The technique zone was a larger challenge for the men as they carried more speed into the start of the zone, keeping the jury busy, although only one athlete was disqualified. Many of the top men used just enough grip wax to prevent ‘gliding herringbone’ and the resulting DQ. There were broken poles and one protest at the merge to four lanes off the start, resulting in one verbal warning from the jury, along with a few quarterfinal crashes on the final turn. The 5-kilometer ‘Upper World Cup’ course is not obviously difficult to someone casually skiing it in Zone 1; there is one mildly challenging corner, one steep climb (‘the wall’), and the total climb is at the lower limit of the International Ski Federation (FIS) homologation range. But racing it is another story, as evidenced by several top finishers after Sunday’s 10/15 k freestyle interval starts who used words like “nightmare”, “hardest”, and “most painful” in post-race interviews. In the men’s 15 k, Ian Torchia, a Northern Michigan University (NMU) junior and member of the USST D-team, was on fire, ranking fourth after two of three laps. He described suffering on the last lap and relying on a ride to keep his speed up, but still managed to ski the fastest final lap (in 12:15.7) to take the victory in 36:29.7. Hegman placed second, 19.0 seconds back, improving on his fourth place from the sprint. Canadian Para-Nordic skier Brian McKeever, who skipped the Canmore International Paralympic Committee (IPC) World Cup to race at Sovereign, notched third (+22.6). Sun Valley’s Kevin Bolger skied three very even laps (11-second variation from fastest to slowest) to finish fourth. 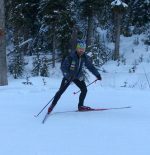 Craftsbury’s Adam Martin took fifth (+28.3), just edging out Para-Nordic guide Graham Nishikawa, who led Torchia into the finish and placed sixth (+29.1). A perennial podium threat at Sovereign and the previous weekend’s SuperTour distance winner, Brian Gregg, of Team Gregg, Central Cross Country (CXC) and Loppet Nordic Racing (LNR), took the lead after Lap 1 with a time of 11:49.8. But by the end of Lap 2, he was visibly losing power, clocking the 18th-fastest lap time, before his 13:10.4 final lap ranked 45th for 16th overall (+1:09). Thompson, wearing the NorAm leader’s bib after his victory on Saturday, finished 19th (+1:17.2). 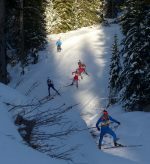 The combined NorAm and SuperTour fields made for a highly competitive event, with the top 40 men finishing within two minutes of first. In the women’s 10 k, Patterson moved up from her sprint second place to notch her first win of the season in 27:13.0. She was 30.7 seconds clear of runner-up Rosie Frankowski (APU), and Frankowski claimed second by just one second over Caitlin Gregg (CXC/LNR/Team Gregg) in third. Katherine Ogden, a Dartmouth College freshman and member of the Stratton Mountain School (SMS) and USST D-team, placed fourth (+50.1), just ahead of Becca Rorabaugh (APU) in fifth (+52.7) and Mary Rose (SVSEF) in sixth (+1:00.9). Retired biathlete Zina Kocher was the top Canadian in eighth (+1:31.2). Kocher (who raced at Frozen Thunder in November under her new married name of Lawson) will compete as Kocher this season as FIS requires a new passport to register a name change. Not surprisingly for a former biathlete, she enjoyed the skate distance race much more than the classic sprint. CNEPH’s distance specialist Frédérique Vézina was the second Canadian in 12th overall (+2:03.3). If you didn’t get your fill of video links above, the local tv station visited the day before the sprints and presciently chose Thompson for their first interview. They also talked to APU’s Erik Flora. For more distance photos, find XTS Photography on FaceBook. Are there photos we are missing? Share with info@fasterskier.com and include photo credit information.